TEPCO wants to dump 1 million tons of radioactive water into the Pacific the government want to release it gradually. The Japanese government and TEPCO (Tokyo Electric Power Co.), the operator of the Fukushima plant have reached an impasse over what to do with a million tons of radioactive water, stored on site in around 900 large and densely packed tanks that could spill should another major earthquake or tsunami strike. According to AP experts advising the government have urged a gradual release to the nearby Pacific Ocean. (there is no known technology to remove tritium from the water at present), although Tepco claims it is safe in small amounts. Conversely, if the tanks break, their contents could slosh out in an uncontrolled way. 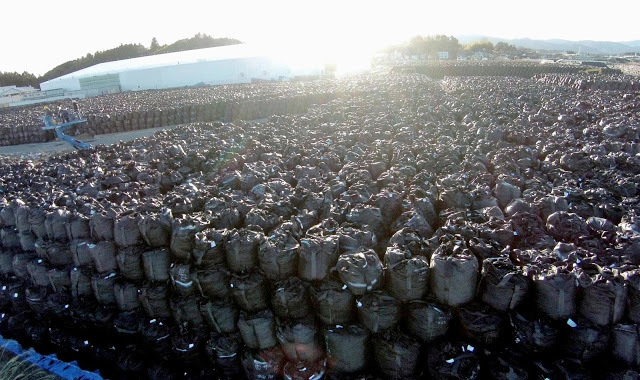 Tepco wants to dump the million tons of radioactive water into the Pacific. The Japanese government wants TEPCO to release the radioactive water gradually into the Pacific! The water is stored on site in around 900 large and densely packed tanks and could spill should another major disaster strike. That TEPCO and the government are even discussing dumping the radioactive water into the sea at all is a wonder after a study by the University of Hawaiʻi at Mānoa who have revealed almost 50% of fish consumed on the islands of Hawai’i were contaminated with caesium 134 the radioactive finger-print of Fukushima. TEPCO is claiming the stricken plant will take at least 40 years to clean up which in its self is a very bold claim considering there is no known technology discovered to stop the disaster. TEPCO claimed in 2013, 300 tons of radioactive water was leaking daily into the Pacific. I don't buy any tuna cans from the Pacific any more! It seems funny that these claims are always on obscure website no one goes too. Much like that of flat earth morons. Where is the proof, where are the documents showing 50% of the fish is contaminated? Claims without proof are like that of climate change junk, just garbage with no basis. At the bottom of the post is a link to the Hawaii University's report and the obscure website no one goes too, well, you did!